Designed to be a high-level, approachable resource for engineers who need further insight into spatial temporal information systems from an ontological perspective, Spatial Temporal Information Systems: An Ontological Approach using STK® explains the dynamics of objects interaction from signal analysis to trajectory design, spatial modeling, and other spatial analytics by using STK®, which is a general-purpose modeling and analysis application for any type of space, defense, or intelligence system. Building a foundation to begin the study of spatial temporal information systems, the book details a form of analysis that is a powerful tool for modeling, engineering, and operations of space, cyberspace, satellites, missile defense, and electronic systems. It discusses the many applications of space technologies by using a mission-proven software for timely and cost-effective development that serves public interests in civil, commercial, academic, national, and international space communities. Written for readers with a background in physics or engineering, the book is also designed for the beginning analyst sitting behind a desk who needs more information on STK. Upon reading this book, STK new users and power users will not only understand what the tools are, but also how the software can be used to make their job easier. In addition, satellite operators and analysts benefit from the ability to utilize a variety of propagators satellite applications. Analytics, semi-analytic and numerical integrators are discussed, including Keplerian orbital elements and full numerical integration of STK’s High Precision Orbit Propagation or simplified as a two-body analysis. This tool, as well as this book, will bring breadth and depth to the understanding of systems dynamics and the ontology of objects in relationship to other objects and vehicles including central bodies. "… the definitive work to guide STK users in maximizing the potential of this powerful spatial temporal information system. The material is well organized, clearly articulated, and superbly illustrates the breadth and depth of this software. This book is the best in its field and STK users from high school to space operations centers will greatly benefit from owning it." "McNeil and Kelso move beyond a mere software feature walk and instead take the reader through a guided tour of how to solve specific problems with each of the modules of the tool. … A novice can use this book as a primer to learn the software suite and get exposed to the wide variety engineer problems it addresses. However, even the most experienced user will appreciate the new perspectives on the nuances of the tool and its application that this book provides." 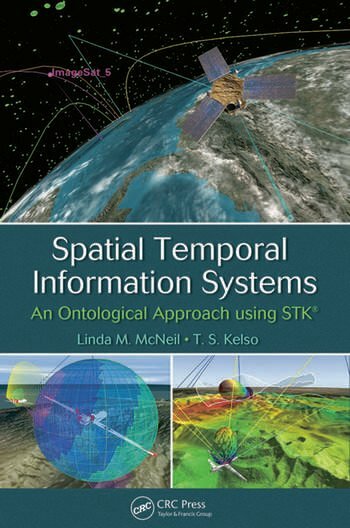 "… an incredibly comprehensive introduction to using Systems Tool Kit (STK) software for modeling and simulating spatial temporal information systems. … a must-have resource for anyone who wants to learn the basics of STK – from rocket scientists to engineers and students!" " the authors have done a very good job highlighting an important study area where ontological representation using STK could be the way forward for the next generation of SpatioTemporal Information Systems.